Well, I finally figured out what I wanted to donate for the 2015 American Peony Society Convention Auction. When I found it, I liked it so much I had to buy two - one for the auction and one for myself! I had never heard of this designer before. 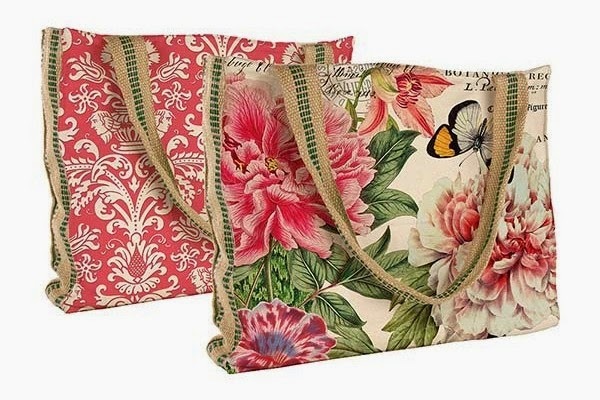 I just found it by doing a search for peony tote, since I had somewhat of an idea of what I was looking for. I just didn't know exactly what, but as soon as I saw the photo of this Michel Design Works Peony Designer Tote, I knew this was just what I was looking for! I haven't received it in the mail yet since I just ordered it this week. So I can't tell you much about how it feels or how it carries. However I'm sure it's an awesome bag, and if it is anything less than spectacular, I'll be sure to let you know. If you would like the chance to bid on this Designer Peony Tote and all of the other items (lots of peonies!) in the APS auction, be sure to join us at the 2015 American Peony Society Convention!